Ida Colvert Stockton … Stockton. | Scuffalong: Genealogy. Ida Colvert Stockton … Stockton. – Scuffalong: Genealogy. Ida Colvert Stockton … Stockton. My great-grandfather, Lon W. Colvert, had four half-sisters — Selma, Ida May, Lillie and Henrietta. Selma died of “exhaustion from severe burns” when my grandmother was 8 years old. Ida May and Lillie remained in Statesville all their long lives. My grandmother of course knew them, but there is a disconnect somewhere in there that I can’t quite pinpoint. Why were there no extended Colvert relatives at our early family reunions (when many were still alive), as there were extended McNeely kin? Why didn’t my mother know her grandfather’s people? It is perhaps as simple as my grandmother and her sisters being closer to their mother’s large family in childhood, especially given their father’s relatively early death. Over the years — my grandmother left Statesville for good in 1932 — these patterns persisted, solidified and were passed down. Perhaps. It seems odd to me though. Lon’s sisters were roughly the same age as his oldest set of children, and Ida May’s oldest children were roughly the same age as Lon’s youngest. The families lived in close proximity in south Statesville. What was up….? I have blogged quite a bit about Henrietta Colvert — the aunt my grandmother knew best — who was one of North Carolina’s early African-American registered nurses. I have tracked Henrietta across the arc of her career, which happened to unfold in my hometown of Wilson, North Carolina, almost 200 miles east of Statesville. She left Wilson sometime after World War II, and I have intermittent glimpses of her whereabouts prior to her death in Roanoke, Virginia, in 1980. What of the other sisters though? I’ll start with Ida May. Though John W. Colvert and Myra Hampton began their relationship in the late 1880s, they did not marry until 1905. Ida, their first child, was born about 1887, and three more daughters followed in short order. None of the family, however — not John, not Addie, nor their girls — are found in the 1900 census. A lot happened in the next decade though. The 1910 census of Statesville, Iredell County, at 214 Garfield Street, shows Ida M. Stockton, a 25 (actually, 23ish) year-old widow with one of three children living sharing a household with her brother-in-law Eugene Stockton, 37 and married, her brother-in-law Jesse Stockton, and her son John, 1. Ida was a laundress, Eugene a tobacco roller at a tobacco factory, and Jesse, an odd job laborer. This arrangement would not ordinarily raise eyebrows, but — widow? Wasn’t Eugene Stockton Ida’s husband??? Why is he listed as her brother-in-law? The birth certificates of all her children, including John, list Eugene as their father. Had Ida previously been married to one of Eugene’s brothers? (Census and death records identify several, including Arthur (born circa 1875), Fred (1885), Jakey (1887), Jesse Lee (1889), and David (1891).) If so, I have not found evidence of a license. And if not Ida, to whom was Eugene married in 1910? That last question turns out to be pretty easily answered. On 24 June 1903, Eugene Stockton, son of Henry and Alice Stockton, married Ella Cowan, daughter of Peter and Clementine Cowan in Iredell County. I have found no evidence that the couple had any children. In the spring of 1912, their divorce suit, styled Eugene Stockton vs. Ella Stockton, was listed several times in the court calendar published in the Statesville Sentinel. By 1918, when Eugene registered for the World War I draft, he listed his sister Gertrude Stockton as his next of kin. Finally, as her mother’s had been, Ida May’s steadfastness was rewarded. On 8 July 1922, Eugene Stockton, 49, son of Henry and Adley Stockton, and Ida May Stockton, 35, daughter of John and Adeline Colvert, were married by Z.A. Dockery, M.G., at “Eugene’s house” before Bessie Abernathy and E.A. Abernathy. In the 1930 census, the family at last is listed openly: Eugene Stockton, 57, wife Ida M., 45, and children John, 20, Lily M., 18, Sara, 17, Alonzo, 12, Winifred, 11, and Eugene Jr., 6. 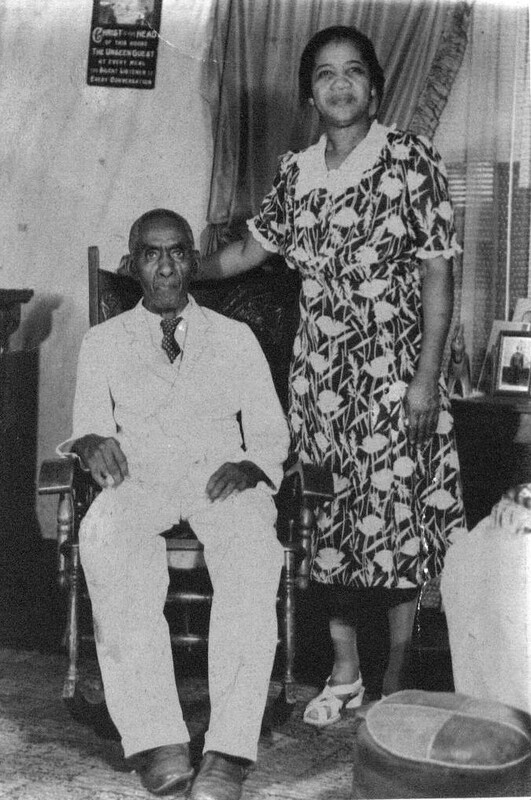 Eugene and Ida May C. Stockton, probably the early 1940s. Eugene Stockton died 26 February 1944 in Statesville. Ida May Colvert Stockton Stockton outlived him by more than 20 years. On 23 August 1967, she passed away a week after suffering a stroke. Statesville Record & Landmark, 26 August 1967. Photo courtesy of A. S. Barton. → Jonah Williams and the Turner Swamp Primitive Baptist Association. ← 52 Ancestors in 52 Weeks: 1. Fresh start.